When I saw this, I had to do a double-take – I almost thought that this was Gujarati for a minute. Devanagari letters hang from the thin horizontal lines, pre-drawn on the chalkboard. Na and Ma are written with looped forms, starting low and on the left, then angling upward to the right. The Ga is similarly low and large-looped. The Da is quite small and curvy, an interesting attribute. It was great to see glimpses of informal handwriting – most of what I saw on the trip was either computer-generated signage or meticulous sign painting. that looks so cool. I love the Devanagari script. I also thought this was Gujarati before closely reading the letters. I also had the “Gujarati” reaction at first. The high joins you mention are also pretty well normal in the fluent adult handwriting in the Indian Type Foundry Flickr set you linked to several months back, especially in Gujarati. And it’s also a standard feature of Kaithi. Gujarati’s a common enough sight in Girgaum. Since this is a Ganpati mandal (est. 1941! ), though, you know it’s gonna be Marathi. Chris is right about high joins… you’ll see them alluded to here: http://fonts.webtoolhub.com/font-n14853-aarti.aspx The big bindis are pretty girly, though, like the way 3rd graders dot their i’s with hearts. Maybe the chalkboard has something to do with it, but it looks like schoolteacher handwriting to me. You’re responsible for Katari, right? Great work! Would love to meet next time you’re in Bombay. Hey Erin, it’s more a case that I obsess over this particular detail (and some others) more than most people. It goes back to when I first realised that the old Philippine script (“Baybayin”) relates systematically to the letter shapes of Gujarati, including its characteristic short curly tail instead of the mid-level join to the stem in standard print Gujarati. The curly tail makes sense as a simple shortening of the stem with a gliding top join, just like what you find in many people’s handwriting. Before now, the origin of the Philippine script and several others in Indonesia has confounded researchers, but things fall into place systematically with the hypothesis of an early Gujarati connection. 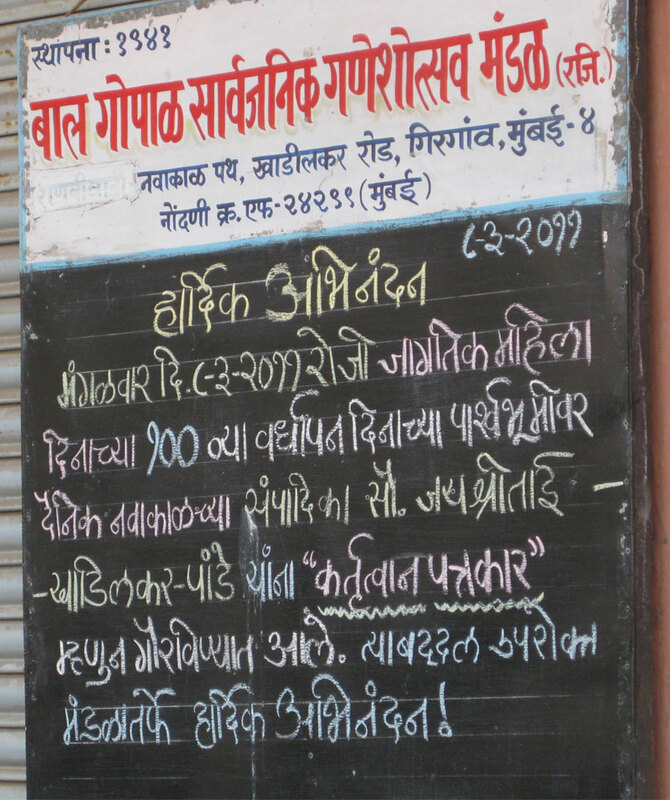 The word कर्तृत्त्ववान has been wrongly spelt as कर्तृत्वान in the text on the board.